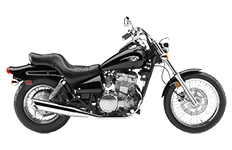 Recognizable cruisers from every street corner, Kawasaki's Vulcan 500 and EN500 motorcycles feature a classic design for riders on the go. If you're an owner of one of these sweet rides, you already know which styles work best for the bike and which ones clash. Because you'll eventually need a sturdy pair of 500 saddlebags to haul your luggage, we feature this full collection of Viking Bags designed to fit your Vulcan 500 and EN500 perfectly. No extra drilling, measuring or cutting is needed!